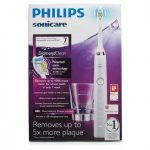 The Philips Sonicare DiamondClean is one of the most advanced electric toothbrushes on the market to date. Although being subjective, it is also probably one of the most beautifully designed and ergonomic toothbrushes available. It has a ceramic finish which makes it look like its made of platinum and a ‘hidden’ illuminated display. The Sonic Technology Dynamic Cleaning action ensures a thorough cleanse, by driving fluids through the teeth that remove plaque, and it does so 7x more efficient than manual toothbrushes. Using the DiamondClean will also improve your gum health significantly within two weeks. The DiamondClean has 5 cleaning modes: Clean, Gum Care, Polish, Sensitive and Whitening. To improve your brushing, it is equipped with a timer that signals when to switch to another quadrant and when your 2-minute brushing period is completed. The brush of the DiamondClean has diamond-shaped bristles that increase the surface area and thereby the cleaning effect, but it also improves the whitening of your teeth. This electric toothbrush whitens your teeth twice as much as a manual brush! Ever Used Your Laptop To Brush Your Teeth? 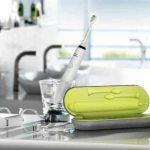 The traveling case can be charged via USB, so you can use your laptop as a backup power source for your electric toothbrush when you are on the road (or whenever you like). It also comes with a wall plug and a glass charging station, that looks so much better than the general charging station used for electric toothbrushes. 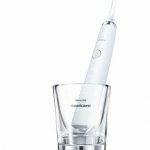 You don’t want to have a beast in your mouth, but the Philips Sonicare DiamondClean is a beast when it comes to cleaning, but a beauty when it comes to feel and design. 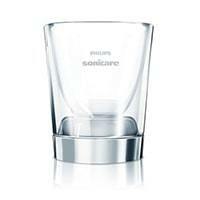 With great Philips technology and innovation, using this toothbrush will be a daily treat. All this technology comes at a price, but for those who can afford it, it is money well spent!